The chronicles of the old Portugal report this episode that took place in the year 1182, on the day of the exaltation of the Holy Cross. Dom Fuas Roupinho, a knight and vassal of King Afonso Henriques, was out hunting on a foggy day. He was pursuing a deer when it came to an unexpected precipice and fell to its death into the sea below. The horse, which was in close pursuit, reared on the very edge of the cliff, and it seemed certain that Dom Fuas would follow the deer to his death. Knowing that a little distance to his left was a cave with the statue of the Virgin of Nazareth, Dom Fuas immediately invoked her protection. He was saved, and in thanksgiving he built a small “chapel of memory” (Ermida da Memória) over the cave in her honor. According to a document found with it, the little statue of the Virgin had been venerated in Nazareth in the times of early Christianity. When the iconoclast heresy started in Constantinople and the heretics were destroying all the statues, a monk called Ciriaco took it to a monastery in Spain in the proximity of Merida. In 714, when the Saracens invaded the Iberian Peninsula, King Rodrigo fled with Friar Germano to the Atlantic coast, bearing the statue with them. They hid the statue in a small cave off the coast of the site that was later to become Nazaré, where it remained until it was found by a shepherd in 1179. After Our Lady miraculously saved the life of Dom Fuas, the devotion to Our Lady of Nazareth spread broadly through the country and was the source of countless graces for the people. In 1377 King Fernando ordered a Church to be built near the little chapel, and the statue is venerated there now. The fact is full of grandiose memories from History. Dom Fuas Roupinho was one of the great heroes in the battles that marked the birth of Portugal and its independence from Spain. The scene is superb: a noble hunting on a foggy day near the ocean. The deer he is chasing falls to a sudden death from a precipice. His horse rears at the edge of the cliff, and it seems certain he will die. 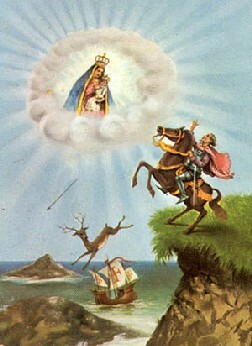 He prays to Our Lady in a nearby cave, and she intervenes. The horse recovers and the noble is saved. The statue of Our Lady is one that was venerated in Nazareth at the beginning of Christianity. How many crooked lines Divine Providence used to make this statue be there to save a Portuguese noble, right at the very time when Portugal was being founded. The episode is very poetic. It also shows the diverse ways Our Lady uses to foster a devotion. The statue was venerated in Nazareth. Then, in flight during a persecution, it went to Spain. There it made a profound impression on the King, who took it with him when he was also obliged to flee. He and his companion, a friar, placed the image in a cave. Later it was found by a shepherd, and the devotion continued, although it was barely surviving. It would, however, grow enormously after Our Lady saved Dom Fuas Roupinho. When devotion began to diminish in the Middle East, Our Lady made her statue go to Spain. When the devotion began to cool in Spain, she inspired a King to bring her to a place that would be part of a new country, Portugal. From there, the devotion would spread throughout that land and to other countries for the good of many people. Two hundreds years ago, the same devotion came from Portugal to Brazil, to the city of Belém do Pará. At the sanctuary of Our Lady of Nazareth, there is a center of pilgrimage year round. On the day of her feast, more than one million people go to venerate her. The story reveals the way Our Lady often works her wonders. It reminds me of that principle of the theology of History – residuum revertetur [the remnant will return]. When everything seems to be near an end, when only a remnant remains faithful, then everything is reborn from it. 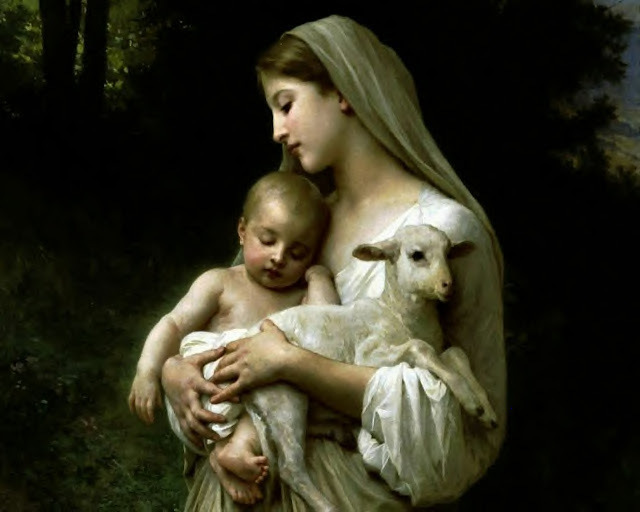 A series of failures followed by rebirths - this is often found in the ways of Our Lady. Her ways are the royal ways of a Queen. She permits everything to almost disappear, and then she proves that she can re-establish everything. She restores what was there before and even more from only a remnant. This is the rhythm History follows: we had the apogee of the Catholic spirit in the Middle Ages. Now we have its complete failure and the apogee of the revolutionary spirit. A remnant remains faithful fighting to destroy the Revolution and make the Reign of Mary, which will be built and reach an apex still higher than the Middle Ages. The decadence of the Reign of Mary will bring, in its turn, another epoch that will represent the victory of the Antichrist. Then also, a remnant will remain faithful to fight the evil. The fidelity of that remnant will be rewarded with the second coming of Our Lord and His final triumph, along with the triumph of Our Lady. This grandiose historical law also applies to our individual spiritual lives. When we experience an apparent failure, we should confide and pray to Our Lady because often it will be the re-starting of a new step in our devotion to her.